Jednotka TCI pro bezkontaktní zapalování (B-jakost). Switch unit for TCI (B-quality). Ignition Module, the last Beetles and many T25 Buses are equipped with an electronic ignition which are controlled by the ignition module. 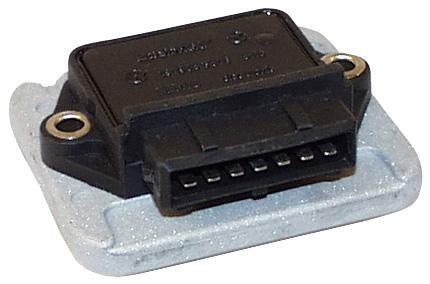 Problems with this ignition module are common: hard starting, erratic running and can spontaneously turn causes a faulty ignition module. You can not do anything to fix it, it is a closed module that only in its entirety can be replaced. The ignition module becomes defective often by poor / faulty ignition coil, bad spark plugs or spark plug wires. It is therefore important that these parts are in good condition and must otherwise surely be replaced, since the ignition module differently breakdown.